Star Wars Battlefront II is off to a rough start with crummy lootboxes and unpopular unlockables. Thankfully, everyone’s favorite smuggler is living life with no reservations and isn’t afraid to show it. Most of Battlefront II’s campaign focuses on Iden Versio, an Imperial commando struggling to survive after the Empire’s defeat at the Battle of Endor, but every now and then the perspective changes to some of our favorite heroes. 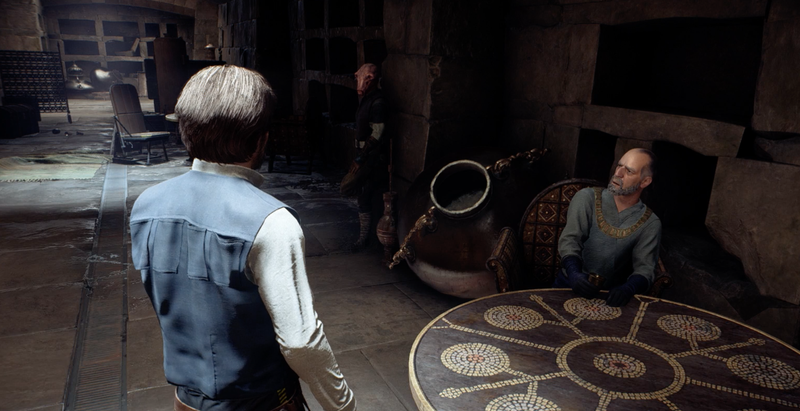 About halfway through the game, we get to see Han Solo make make contact with an Imperial defector at Maz Kanata’s castle on Takodana. He looks like you’d expect, wearing his signature vest and rocking a chunky blaster pistol. There’s just a tiny difference. No, friends, it isn’t a miniature wookie on Han’s face. That’s a beard, and a pretty terrible one at that. It instantly turns the smooth-talking smuggler into an interstellar version of The Dude from The Big Lebowski. I’m fairly certain this is a reference to the Aftermath series of books, which, like Battlefront II, are set in the events following Return of the Jedi. That’s some good continuity, as well as a good reminder that Han, like everyone, has made a few mistakes in his life. If you’re eager to make the same mistake, you can even equip this look as a skin in the multiplayer.